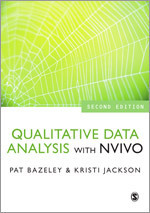 Welcome to the online resources pages for Qualitative Data Analysis with NVivo, 2nd edition. This companion website provides you with some additional resources to assist you as you learn about the tools provided by NVivo and apply them to your data. Qualitative Data Analysis with NVivo is designed for researchers who have qualitative data and want to use NVivo to manage and analyse it. The chapters in the book walk you through the processes involved in undertaking a project with the assistance of NVivo, as you prepare, code, link, memo, sort, compare, and query your data. This second edition contains new chapters on handling a literature review, visualizing data, working in mixed-methods and social media datasets, and approaching NVivo as a team. Essential instructions are provided in a context that explains their use, with multiple examples, tips, and warnings based on the extensive practical experience of the authors in undertaking analyses and in using and teaching the software. We blend the basics of qualitative methods with a computer manual in order to help you more elegantly engage in qualitative methods using NVivo. For a guide to more detailed and advanced issues in qualitative methods see: Pat Bazeley, Qualitative Data Analysis: Practical Strategies (SAGE, 2013). Please click on the links below to access Chapters 1 and 2. Pat’s Researchers project provides an additional sample project for you to explore and learn from. A full list of file formats that can be imported (as internal sources) into NVivo. Examples of hierarchical coding systems, and instructions for sorting out a ‘viral’ system. A map of all the options offered by the query tools . These provide additional ideas about what you can do with a query in your research, or you might use this guide if you encounter one of the advanced options while constructing a query and would like additional information about what it does. BONUS: Formatting with Word(TM) 2007-2010contains useful instructions about formatting with Word(TM). An annotated bibliography of articles, chapters and books that include historical works, discussions on the relationship between software and methods, and guidance for best practice when working with various qualitative data analysis programs in general and NVivo in particular. These will be provided on this website as needed, i.e., when new versions of the software introduce new ways of working with your data. the software – system requirements, pricing, etc. We hope you enjoy your NVivo experience, and even more, that you find it helpful in analysing and learning from your qualitative or mixed methods data! Many of the materials on the instructor site, are only available to Faculty and Administrative Staff at Higher Education Institutions who have been approved to request Review Copies by SAGE. To create an account, please click here. In order to be approved, you must provide your institution and the course that you are or will be teaching. Once you have created an account and you have been validated as a faculty member, you will be able to access the instructor site. Please note: Validation usually takes approximately 24-48 hours to be completed. If you have any questions, please contact SAGE Customer Service at +44 (0) 20 7 324 8500 from 8:30 am to 5:00 pm.